Driving in the city can be rather overwhelming. Half the drivers seem to have no idea where they’re going, while the other half are zooming in and out of traffic with abandon. Parking is practically impossible, and traffic can be beyond tedious. City driving undoubtedly increases stress, which challenges the overall driving experience. Plus, considering the recklessness presented by some of your fellow drivers, safety is also decreased. Fortunately, there’s an excellent compact SUV that has been adapted to provide an optimal city-driving experience: the 2016 Chevy Trax. The vehicle offers everything city drivers could possibly want from their rides, whether it’s an array of technological amenities, a dependable and efficient engine, or the abundance of safety capabilities. If you’re going to be cruising around in a busy city, you’ll surely be looking to impress your fellow drivers. Well, fortunately, the Chevy Trax provides plenty of opportunities to do so. When all is said and done, drivers have plenty of ways to customize their new compact SUV. If Trax owners want to stand out in the city, they can certainly do so. The Trax is the perfect choice for city driving. The compact SUV is deceptively roomy, but not excessively big. So, drivers can better manuever around those tight streets and corners. Parking should also be easier, and drivers won’t have to worry about dinging their stylish exterior (which includes wheel flares, new headlamps, and Chevy’s dual-port grille). Meanwhile, the interior provides enough room to store any luggage or equipment so Trax owners can escape the buzz of the city and head to the lake or mountains for the weekend. The 60/40 split-folding rear seats allow for maximum versatility, and drivers can easily utilize the 48.4-cubic-feet of maximum cargo room (18.7-cubic-feet with the seats in place). The Trax offers an additional 15 standard storage areas, meaning occupants will have no issue storing or hiding their most valuable cargo. Whether you’re driving in the city or escaping the concrete jungle, you’ll learn to appreciate the Trax’s dependable engine. The 1.4-liter turbo engine offers plenty of muscle at 138 horsepower and 148 pounds-feet of torque. Plus, thanks to the all-wheel-drive capabilities, the Trax will be more than able to overcome any adverse weather or road conditions. The system will also automatically switch to front-wheel-drive, thus improving efficiency. Of course, the Trax’s engine is also plenty fuel efficient thanks to technologies like Variable Valve Timing. The system can deliver a 26 city/34 highway mile per gallon efficiency, numbers that aren’t often seen in SUVs. It can be difficult to find a gas station in a busy city, so drivers can be assured that they’ll be able escape that urban area without running out of fuel. Of course, considering how many cars can litter a city road, the chances of an accident are predictably boosted. Fortunately, the Trax offers a number of safety features that should keep the SUV (and its occupants) secure. The StabiliTrak Electronic Stability Control system will prevent the Trax from spinning out or swerving, preventing an accidental crash. Meanwhile, the Rear Park Assist technology will make for easy parking, and drivers can also rely on the rear vision camera to monitor everything that’s happening behind the SUV. If a driver does experience an accident, he or she can be assured that the 10 air bags will provide the necessary amount of cushion. The high-strength steel safety cage should also help prevent the collision’s energy from reaching the passengers. Best of all, the Trax is equipped with OnStar’s Automatic Crash Response. The system automatically connects a driver with an OnStar Advisor, who will send police, fire, or EMTs to the crash site. There’s a good chance that you’ll be sitting in traffic as you’re traveling throughout the city. Thankfully, the Trax offers enough technology to keep all of the occupant’s entertained. Chevy’s MyLink infotainment system allows drivers to easily access a number of applications, including Pandora Radio or SiriusXM Satellite Radio. Thanks to the Siri Eyes Free technology, drivers can connect their smartphones to the system, allowing them to make hands-free phone calls. The Trax even offers 4G LTE Wi-Fi, so passengers should never have an issue connecting to the internet. Finally, the OnStar Remote Link app allows drivers to monitor their Trax from their smartphones. Drivers can lock or unlock the door, start the engine, and even access the vehicle’s lights. This not only makes for an excellent convenience application, the technology can also provide some extra security (an especially appreciated attribute in the city). 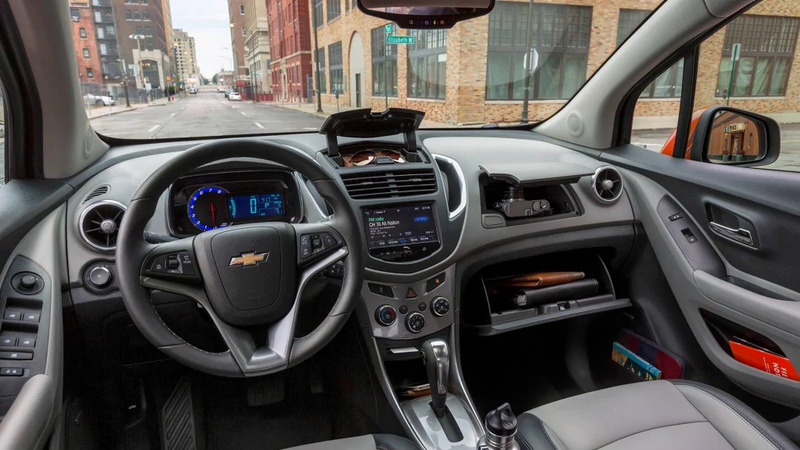 There are a number of reasons why the 2016 Chevy Trax is an excellent city vehicle. Of course, as you may have picked up on, the compact SUV is an excellent choice for any driver, anywhere!